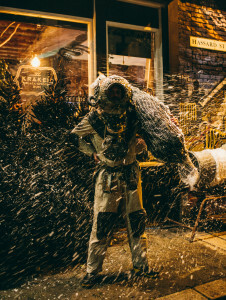 Kraken celebrated the festive season in its own unique way by opening a bar and Christmas tree shop – Think Ink Pines – selling the world’s first real black trees. The Kraken Rum Bar and Christmas tree shop was open for one week only from the 9th – 13th December and was Kraken’s long anticipated follow-up to its highly successful Black Flower Florist which opened at Valentine’s Day. Located at 186 Hackney Road, London, visitors walked into a world of black firs, wreaths and mistletoe, nestled alongside the festive Kraken Black Spiced Rum Bar. 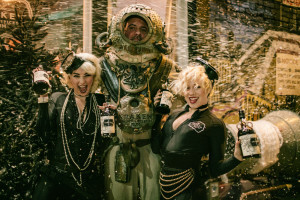 Throughout the day, the bar served up specially created Christmas cocktails including: Squid Bite, Black Espresso, The Old Kraken, Perfect Storm and Kraken ‘S’pore’, so guests could get thoroughly warmed up while admiring all things Kraken.